Buy groceries on your train commute using a smartphone and a billboard. Samsung and LG have already unveiled some “smart fridges” that include Wi-Fi, apps, and scanning technology to keep tabs on inventories, expiration dates, recipes and even caloric intake. While the technology is still young, a new virtual service from established online grocery retailer Peapod may help broaden the appeal of smart fridges. This week, Peapod began to open some of its 100 planned "virtual" grocery stores at commuter rail stations in Boston, Connecticut, New York, New Jersey, Philadelphia, Washington, D.C. and Chicago. The future of food shopping begins now. How Does a Virtual Grocery Store Work? Commuters use their smartphones to scan for items on an interactive billboard using Peapod’s free mobile app. They can then choose a delivery schedule for their items, thereby “making the most” of their commute. In a press release, Peapod explained that the idea for the service stemmed from the recognition that many Americans—particularly those with a long commute—have trouble fitting grocery shopping into their weekly schedule. "With schedules that are more demanding than ever and people spending 200+ hours a year in transit, our hope is that consumers will take advantage of our virtual stores and mobile app while they're on the go and enjoy the time saved when they're at home," said Peapod COO Mike Brennan. Okay, maybe this service will make things easier for some Americans. But we wonder, is it really that much more of a time-saver than, say, ordering groceries on your smartphone as you make that long trek to or from work? We imagine it would take even longer to stop and scan a bunch of QR codes on a train platform, hoping all the while that you can finish shopping before the train arrives. 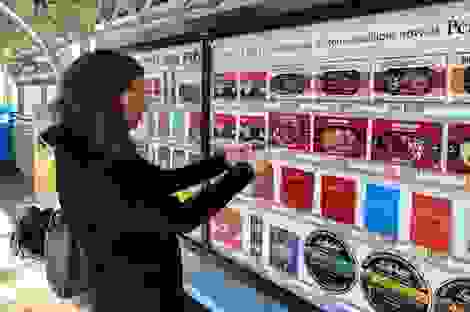 That being said, initial tests of the service in Philadelphia and Chicago proved successful, and the concept has already been in use in South Korea for some time—mostly because Korean cities have less space for huge grocery stores. But what’s really interesting about this idea is its relation to other technologies, most notably smart fridges, which have also already taken hold in Korea thanks to Samsung and LG. Will it Change the Way We Shop? This is the scenario that manufacturers and retailers hope will come to fruition: When you place an order with a food delivery service—whether through smartphone or virtual storefront—your shopping list also gets forwarded directly to your fridge. Based on that list, your fridge will track exactly what's inside of it, and when it will go bad. When you’re at the train station, you’ll also be able to tell, for example, how much ketchup you have left or if you need a new carton of milk. So is this the future of grocery shopping? In some sense, probably. But it doesn’t yet come close to the convenience of walking down the street and picking up some fresh produce to cook right away. This article is updated from an earlier version (first published Monday, October 8) to clarify that Peapod is an already-established online grocer, and that the virtual stores are already beginning to open in some cities.